The local people in Ka Moe Thway area, Tavoy (Dawei) town, in southern Burma have called for the Thai government to not to build dirty industry near their homes. 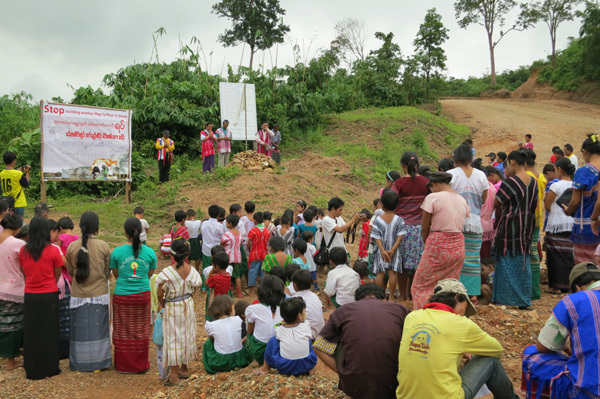 On September 20, around 200 villagers, who live along the Dawei-Kanchanaburi road, constructed by the Thai Italian-Thai Development Company, gathered in Kaw Htee Lor village to pray for a stop to the destruction of their livelihoods by the impact of the construction of the Dawei-Kachanaburi Road and the Dawei Industry Zone. Map Ta Phut, Thailand’s largest industrial estate that consists of a petrochemical complex in Rayong Province is considered an environmental disaster. Saw Ko, the leader of the Ka Moe Thway Community Sustainably Livelihood Development, spoke to Karen News. Saw Ko We said his group wanted to send a message to the Thai government that the people need more information about the development project in Dawei. The massive $60 billion Dawei Project includes the development of a deep seaport, an industrial estate that will have a steel mill, a fertilizer plant, coalfire power plant, a pipeline that runs along the road-link into Thailand’s Kanchanaburi Province and highways and a railroad link into Thailand. The Dawei Deep seaport and Industrial Estate will cover, when finished, an area of 205 square kilometers. Thai researchers claim the planned industry zone is 10 times larger than Thailand industrial estate, Map Ta Phut. The Dawei deep seaport and industrial estate will be built in the pristine coastal area of Yebyu Township, inhabited by the Tavoyan indigenous people. There are 18 Tavoyan villages, more than 23,000 people will be evicted to make way for the project. It appears the villagers hope that their prayer service would have an effect on Thailand’s Prime Minister, Yingluck Shinawatra, fell short. Thailand’s Prime Minister Yingluck Shinawatra, met with Burma’s President, U Thein Sein, in New York during the UN General Assembly, last week, 28 September, and agreed to accelerate the development of the Dawei deep seaport. Media reports confirmed that the leaders of both Thailand and Burma want to officially announce their plans for the project at the ASEAN Summit in November. The Dawei-Kanchanaburi road construction cuts through five Karen villages in the Kamoethway area and has destroyed villagers’ lands. Naw Ma Nyo, a local woman from Kaw Htee Lor village, lost nine acres of land to the Dawei-Kanchanaburi Road construction, spoke to Karen News. Naw Ma Nyo says she does not think villagers will benefit from the project. At the time of writing there is unconfirmed information from the Italian-Thai workers that the Burmese government is drafting a new law for the Dawei Project that will set the compensation price for the villagers. Naw Paw Shi, a local villager woman form Kaw Htee Lor told Karen News. Saw Ko worries the Dawei Project will destroy the local community.